Wow, what a fun show. Great questions and lively discussion. 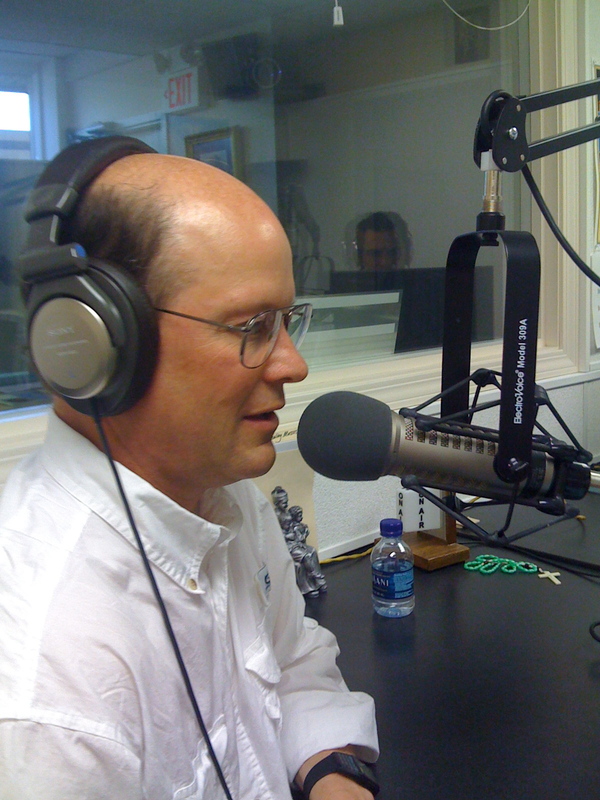 Listen on-line HERE and other audio options HERE. the audio links as soon as they are available on Thursday. 1) When Jesus was asked by Pilate if he was the Messiah he responded, “You have said so.” Why didn’t Jesus just say “Yes”? 2) Is it reasonable to assume that Jesus got splinters from falling with the cross? It is a suffering we don’t hear about but it probably happened, right? 3) One gospel says Judas was offered a morsel of bread by Jesus at the Last Supper. Was that morsel the Eucharist or did Judas leave before the consecration? 4) What was the approximate weight of the cross: Also, do we have any actual pieces of the original cross and how do we know? 5) Was Judas pre-ordained to betray Christ? Do he have free will or was he programmed to betray him and be damned? 6) How did they find the true cross and were miracles performed? 7) When Jesus told his disciples to “take up their cross and follow him” how would they have known what he meant since he had not yet been crucified? 8) Did Mary know that Jesus would be raised from the dead? 9) How did the Stations of the Cross begin? As Promised, an Answer to the Question: Did Judas eat the Eucharist? …It is clear from the Gospel of St. John that Judas left the company of our Lord and apostles IMMEDIATELY after having dipped bread in the sign of betrayal; the Gospel of St. Mark makes it clear that only after the dipping episode did our Lord then offer the blessed Bread and Cup which is the Eucharist. So Judas was not present for the sharing of the First Eucharist itself, and who can imagine a more unworthy vessel of reception for Holy Communion? And so we see a solid basis and case in point for the insistence of the Church–and St. Paul in his letter to the Corinthians–that a Christian be properly disposed and worthy by the presence of grace in order to receive the Most Holy Eucharist. Article 2. Whether Christ gave His body to Judas? Objection 1. It seems that Christ did not give His body to Judas. Because, as we read (Matthew 26:29), our Lord, after giving His body and blood to the disciples, said to them: “I will not drink from henceforth of this fruit of the vine, until that day when I shall drink it with you new in the kingdom of My Father.” From this it appears that those to whom He had given His body and blood were to drink of it again with Him. But Judas did not drink of it afterwards with Him. Therefore he did not receive Christ’s body and blood with the other disciples. Objection 2. Further, what the Lord commanded, He Himself fulfilled, as is said in Acts 1:1: “Jesus began to do and to teach.” But He gave the command (Matthew 7:6): “Give not that which is holy to dogs.” Therefore, knowing Judas to be a sinner, seemingly He did not give him His body and blood. Objection 3. Further, it is distinctly related (John 13:26) that Christ gave dipped bread toJudas. Consequently, if He gave His body to him, it appears that He gave it him in the morsel, especially since we read (John 13:26) that “after the morsel, Satan entered into him.” And on this passage Augustine says (Tract. lxii in Joan. ): “From this we learn how we should beware of receiving a good thing in an evil way . . . For if he be ‘chastised’ who does ‘not discern,’ i.e. distinguish, the body of the Lord from other meats, how must he be ‘condemned’ who, feigning himself a friend, comes to His table a foe?” But (Judas) did not receive our Lord’sbody with the dipped morsel; thus Augustine commenting on John 13:26, “When He had dipped the bread, He gave it to Judas, the son of Simon the Iscariot [Vulgate: ‘to Judas Iscariot, the son of Simon,” says (Tract. lxii in Joan. ): “Judas did not receive Christ’s body then, as some think who read carelessly.” Therefore it seems that Judas did not receive the body of Christ. I answer that, Hilary, in commenting on Matthew 26:17, held that Christ did not give His body and blood to Judas. And this would have been quite proper, if the malice of Judas be considered. But since Christ was to serve us as a pattern of justice, it was not in keeping with His teaching authority to sever Judas, a hidden sinner, from Communion with the others without an accuser and evident proof. lest the Church’s prelates might have an example for doing the like, and lest Judas himself being exasperated might take occasion of sinning. Therefore, it remains to be said that Judas received our Lord’s body and blood with the otherdisciples, as Dionysius says (Eccl. Hier. iii), and Augustine (Tract. lxii in Joan.). Reply to Objection 1. This is Hilary’s argument, to show that Judas did not receive Christ’sbody. But it is not cogent; because Christ is speaking to the disciples, from whose companyJudas separated himself: and it was not Christ that excluded him. Therefore Christ for His part drinks the wine even with Judas in the kingdom of God; but Judas himself repudiated this banquet. Reply to Objection 2. The wickedness of Judas was known to Christ as God; but it was unknown to Him, after the manner in which men know it. Consequently, Christ did not repelJudas from Communion; so as to furnish an example that such secret sinners are not to be repelled by other priests. 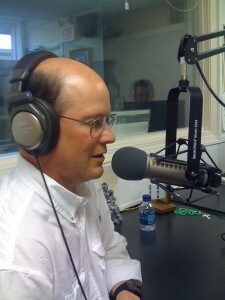 I love Catholic Radio and all that it is doing for the Catholic Faith. I love contributing as much as I can. Here are shows I am doing this week. Donald Rumsfeld served as secretary of defense under both President Gerald Ford and President George W. Bush, but he can’t master the tax code. Every year on Tax Day, Rumsfeld sends a letter to the IRS explaining that he doesn’t know whether he did his taxes properly. 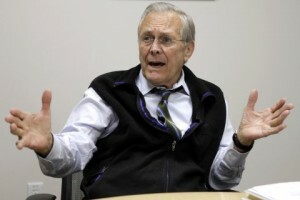 Rumsfeld published his newest letter on his Twitter page Tuesday. 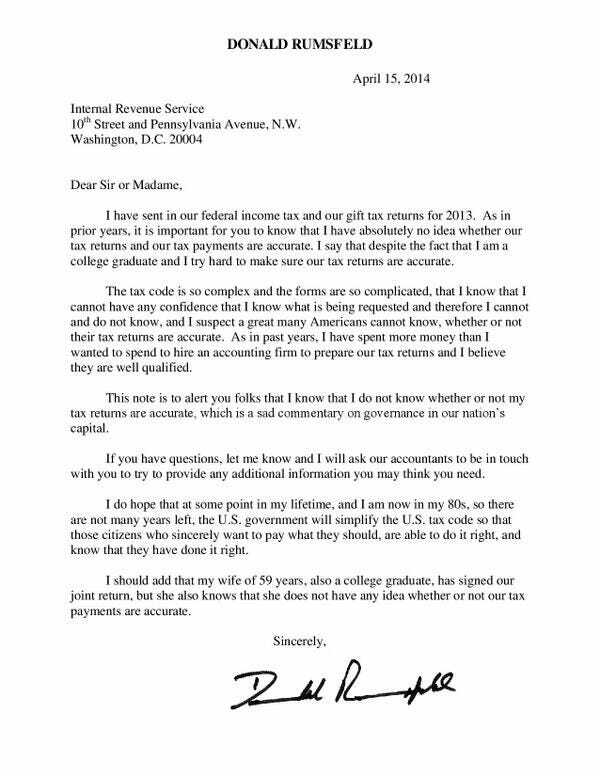 In his letter, Rumsfeld attributed his ignorance of whether he paid his taxes properly to the complexity of the tax code. “The tax code is so complex and the forms are so complicated, that I know I cannot have any confidence that I know what is being requested and therefore I cannot and do not know, and I suspect a great many Americans cannot know, whether or not their tax returns are accurate,” Rumsfeld wrote. “I do not know whether or not my tax returns are accurate, which is a sad commentary on governance in our nation’s capital,” Rumsfeld wrote. Read Rumsfeld’s full letter to the IRS below.